Kitchen cabinets seem pretty standard, but much like other pieces of furniture or appliances, they can be used for different purposes. I know what you’re probably saying, “They’re kitchen cabinets. 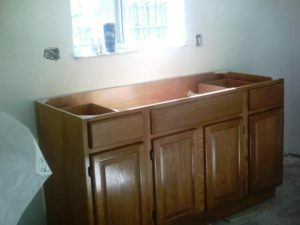 They go in the kitchen and hold things,” but people have found some cool unusual uses for RTA kitchen cabinets. When you’re dealing with 20 or 30 children in a classroom, teachers have to get inventive when it comes to storage. In addition to the endless number of school supplies teachers have to contend with, they also have games, puzzles, files and more that can’t just be sitting out in the room. Imagine how class concentration would be if students could see iPads and Chutes and Ladders games. Many teachers choose kitchen cabinets to house these items and keep them from the prying eyes of students. The cabinets provide ample storage space and countertops can provide areas where children can work with wet or sticky items and not worry about damaging property. When you walk into a doctor’s office exam room, they have everything they need to take care of a variety of needs from gauze and needles for shots to swabs and blood pressure cuffs. Those all need to be stored carefully away from patients. Many small town doctors’ offices will use kitchen cabinets to store these items because they provide a homey atmosphere that helps relax patients instead of the sterile and bland exam room. Certain styles of kitchen cabinets can be both elegant and professional looking, so patients aren’t put-off by them or see them strictly as medical cabinets. The countertops also make easily cleaned workspaces too. Many offices around the country have breakrooms for their employees to come in at lunch or throughout the day and get coffee, have lunch, etc. While the employees provide the food, the employer often has napkins, paper plates, and plastic silverware to use for the convenience of their employees. Kitchen cabinets are a necessity to keep these items out of sight and provide storage for items bought in bulk, such as paper towels. The break area needs to be cleaned regularly as well, so the cabinets house cleaning supplies and extra garbage bags. While the office might not seem like a probable place for kitchen cabinets, it’s actually a common place to find them. Could your office or classroom use a nice set of kitchen cabinets? Check out our design tool and see what styles will work best for you.